Sheffield Utd: Nigel Clough says home advantage is "massive"
Sheffield United boss Nigel Clough believes home advantage will be "massive" in Tuesday's League Cup quarter-final against Southampton. The League One outfit reached last season's FA Cup semi-finals after home wins over Championship sides Nottingham Forest and Charlton. 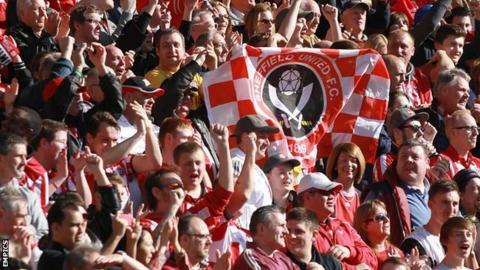 Clough told BBC Radio Sheffield: "If we have any chance at all then home advantage will be a big factor. "The atmosphere is special and it will play a massive part." He added: "Reverse the fixture and you're thinking you've got no chance. But here, despite the opposition, we feel like we have a chance." Ronald Koeman's Southampton side have lost their last four games to slip from second to fifth in the Premier League, while the Blades are currently fifth in the third tier, nine points off the automatic promotion places. Clough, who won the competition twice as a player with Nottingham Forest, believes that his team's league standing allows them to play with more freedom in cup competitions. "We know our aim is promotion so every point that we are playing for is precious," he said. "The cup games give us a bit of a release from that [pressure]. "I don't think it's a conscious thing, I think we just go into games a little bit more relaxed. "If you look at the ties we've had in the competition so far we've always known it would be no disgrace to lose and that will be the case tomorrow night as well."